It's time for a treasure hunting adventure through the hills of Mexico. Click here to play! Help Paco search for buried treasure and you could see yourself taking home a hefty share of the fortune. 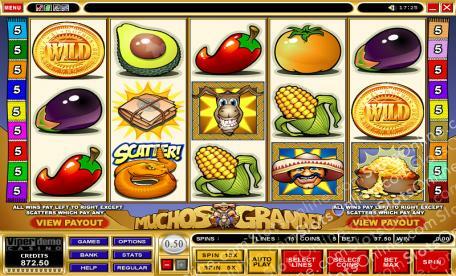 You'll be searching these reels for gold, so you'll want to spin as many golden coins as you can. These valuable little discs are wild symbols and will replace most others to help you bring in more wins. They will also pay out up to 9000 times your line bet if you can spin two to five of them across a pay line. There are also sacks of gold that will bring in wins. Three to five of these sacks will get you up to 450 times your line bet. Stick close to Paco as he will grab up to 400 times your line bet. There are plenty of other symbols to help you in your quest for Mexican treasure, including donkeys, chilies, corn, eggplants, avocados and tomatoes. While you're hitting the dusty trails you'll want to watch out for rattle snakes. These deadly snakes are scatters. Two to five of these reptiles anywhere on the board will multiply your total bet. Don't forget the treasure map! This valuable piece of paper is a bonus and will trigger a feature if you can spin three or more anywhere on the board. It's time to hit the trails in search of Mexican gold. Spin these reels for a chance at plenty of big money wins! The rattle snake symbol is a scatter. If you can spin three to five of them anywhere on the board, you will get 2, 4, 50, or 400 times your total bet. The golden coin acts as a wild symbol. It will not only replace all others (excluding scatters and bonuses), but will also pay out up to 9000 times your line bet if you can spin two to five across an active pay line. The treasure map symbol will trigger a bonus feature if you spin three or more on an active pay line. During this feature you will have to search eight different locations on the map to reveal your bonus prizes.